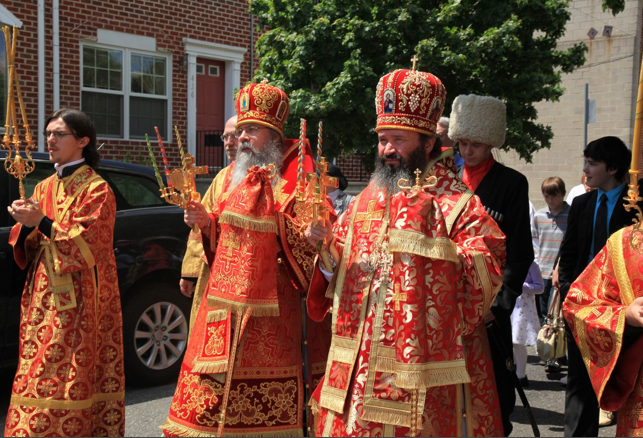 This past weekend Bishop Tikhon (Mollard) of Philadelphia and Archbishop Justinian (Ovchinnikov) of Narofominsk, head of the patriarchal Russian Orthodox representation to the American Orthodox Church, concelebrated the Sunday Liturgy in Philadelphia's Cathedral of St. Andrew. After the Sunday Liturgy the two hierarchs concelebrated a memorial for the World War II dead remembered during today's Victory Day celebrations in the former USSR. More (in Russian) here.